A personal glimpse into the Herbert W. Armstrong College experience. Hi, I’m a Herbert W. Armstrong College student. If you’d like to peek into what life is like at Herbert W. Armstrong College, come with me! My alarm clock rings at 5:45 a.m. I put on my running clothes and go downstairs, where a couple of my bed-headed dorm mates in college hoodies are already leaving for the workout room. One of my buddies is up early reviewing his speech assignment over a cup of coffee. I pat him on the back—I know what that’s like—and jog out the door for my run. I love this time of day, when all sound is muted, when the cool, still air hasn’t yet warmed and stirred and the darkness is only beginning to fade to light. A pair of runners pass me with a wave. From across campus floats the muffled sound of the maintenance shop door rolling up, mixed with assorted animal sounds from the ag department. After about 40 minutes, I’m back to the dorm right around daybreak, time enough for personal prayer time and getting ready for the day—and, if I’m really efficient, breakfast. Our first class starts at 8 a.m.: Principles of Living. That name summarizes the core curriculum at this college: learning the fundamentals of how to make life work. Students at other colleges are learning something much different. Society’s gigantic educational establishment emphasizes ultra-specialized instruction for increasingly narrow fields of study, almost exclusively career-based. The ultimate goal—assuming it’s not just to party and breeze through a dumbed-downed curriculum—is to earn a lucrative living and/or to develop an imperious intellect. What I would call a materialistic mass-production approach is one of the principal things that turned me off to the other colleges and universities I looked at as a high school senior. Students there aren’t taught to analyze, question and prove the institution’s educational doctrine as much as they’re taught to just memorize it. I also was not as interested in holing up in a career specialty as I was in a broad, well-rounded education: learning how to live, how to think, how to reason, how to act—becoming a different, and better, person altogether. And I had some questions. Questions that need answers. Questions that our academic system—descended from Oxford, the University of Paris, the University of Salerno and, ultimately, way back in the day, Plato’s pagan Academy—just does not and cannot answer. Questions it ignores altogether. I guess I can’t blame it. They are hard questions. But I have to know why. We are living in an information age knowledge explosion. Knowledge is everywhere. So why haven’t we learned to solve our problems? We put men on the moon, but people on Earth still starve to death. Why? We still war against each other and murder each other. Why? Human government, industry, business, culture and education are unsalvageably corrupt. Why? Why do religions, of all things, inspire people to kill each other? Why is our world so selfish? And why, despite the best efforts of our wealthiest and most intellectual college graduates, is it getting worse, not better? Why is there no hope? That’s the thing I keep coming back to: Education has not solved our problems! For all its knowledge, it has provided no real solutions! What I really want to know is, why are we here? What is the purpose for my life? I can’t accept that my ultimate potential is to get a degree, a suburban palace and an expensive suv and maybe dazzle my circle of acquaintances with my intellect. There has to be more. At Herbert W. Armstrong College, those questions get asked. And, incredibly, they get answered. Inside these classrooms, our faculty asks those hard questions about the world around us. And via that instruction, our own critical thinking and proving of the truth, we find answers. Even more than that, we find hope! If you want to learn much more about that proof and that hope, read the booklet that’s named after our college motto: “Education With Vision” (request your free copy). 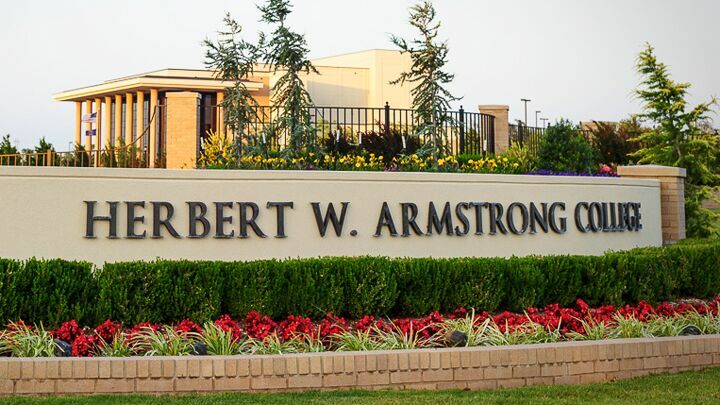 Herbert W. Armstrong College: More hard questions explored by lunchtime than most universities ask all year! Now it’s time for lunch. After a full morning of theology, history, international relations, speech, science, sociology, economics, computer science, business administration and other classes, we students head for a nutritious lunch at the college dining hall. Over a main course, salad and the best soups you’ll ever taste, we discuss the most thought-provoking things we’ve studied and what’s going on this afternoon with each other—and, believe it or not, faculty members. Herbert W. Armstrong College students share a common thirst for the answers to life’s fundamental questions and proving the true answers. We are also interested in developing ourselves into better people and better friends, and better serving each other and society in general. We’re working on ourselves, trying to remove flaws and overcome our many imperfections. I mention this because it has at least one obvious fruit at lunchtime. Amid all the chatter and fellowship, nobody gets left out. There are no “weird kids” or unpopular individuals who have to kind of hang around the fringes. No insults, no cold shoulders. If I had to describe it in one word, it’d be family. Speaking of developing the whole person, the p.m. is free of classes but chock-full of other education. Most of us will work our part-time jobs for the rest of the afternoon as part of the work-study program, which enables us to pay for our tuition and other costs as we go. Plus we learn professional skills and gain work experience in mail processing, television production, call center operation, information technology, editorial, accounting, administration and other fields. It also enables us to contribute to the institution that gives our lives meaning and hope! After dinner, the whirl of activity is, in some ways, just beginning. Intramural sports practices and games, service opportunities, formal events, club meetings, field trips, dating and other activities are all part of the average Herbert W. Armstrong College student’s week. Oftentimes all of the above gets squeezed into a short seven days. It’s a challenge to cram in our studies sometimes, but that just pushes us to grow more. There’s much more to the average day than I’ve been able to describe in my short time with you, but I hope this glimpse has shown you what a day in the life of Joe AC is like. I’ve got an activity I need to get to, but you can always visit us online or in person, and I hope you will! Philip Nice is a graduate of Herbert W. Armstrong College.